Sharon M. Friedman is Professor and Director of the Science and Environmental Writing Program in the Department of Journalism and Communication at Lehigh University. At Lehigh, she served as Associate Dean for Faculty and Staff in the College of Arts and Sciences from 2006-2008, Chair of the Journalism and Communication Department from 1986-1995 and Undergraduate Curriculum Director of Environmental Studies program from 2004 to 2011. Her research focuses on risk communication issues and on how scientific, environmental and health issues are communicated to the public. She has conducted research on mass media coverage of such risk issues as the Three Mile Island, Chernobyl and Fukushima nuclear accidents, Alar, radon, dioxin and electromagnetic fields. Currently, she is studying mass media coverage of potential environmental and health risks from nanotechnology and from hydraulic fracturing or fracking. Friedman has been a consultant to a number of governmental organizations including the President's Commission on the Accident at Three Mile Island, the United Nations Economic and Social Commission for Asia and the Pacific, the U.S. Blue Ribbon Commission on America's Nuclear Future, and the U.S. National Oceanic and Atmospheric Administration. She served on several committees of the National Academy of Sciences as a risk communication expert for radiation and low level radioactive waste issues. She also chaired the U.S. Department of Energy’s Advisory Committee for its Low Dose Radiation Research Program. She is the co-author of Reporting on the Environment: A Handbook for Journalists, which has been translated into 19 languages, and the co-editor of two books--Communicating Uncertainty: Media Coverage of New and Controversial Science, and Scientists and Journalists: Reporting Science as News. She also has written numerous book chapters and journal and magazine articles. Friedman is a Fellow of the American Association for the Advancement of Science (AAAS) and of the Society of Risk Analysis (SRA). She is a member of the editorial board of the journal Science Communication. She recently was elected as a member of the AAAS Council and has served as a member of the SRA Council and as Vice Chairperson for the Board of Trustees of the International Food Information Council Foundation. 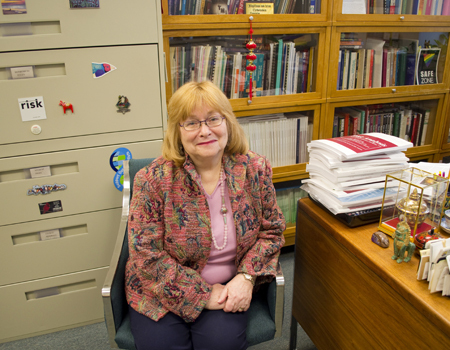 At Lehigh, she was awarded an endowed Iacocca Professorship from 1992-2000, and was a co-recipient in 2006 of the Hillman Faculty Award for excellence in research, teaching and service. In 2009, she was one of five people worldwide to win the International Green Pen Award given by the Asia-Pacific Forum of Environmental Journalists.